PAUL KAGAME, President of Rwanda, said the Assembly's session offered another chance to reflect on how best to reconcile what, at times, were mistakenly considered irreconcilable concepts: socio-economic development and a healthy environment. Leaders and citizens the world over often wondered how to spread prosperity without degrading oceans, rivers and the air we breathe. However, these were also times of extraordinary scientific, technological and business innovations that could help address such challenges, if decision-makers had the courage to harmonize national, regional and global priorities. History was replete with examples of how nations, immersed in crises, had changed underlying assumptions about themselves and created new tools to solve problems. While such innovations would vary, the challenges were the same: creating a shared vision; increasing trust among peoples; and adopting a moral purpose to achieve such goals. He said today the world community had an exceptional opportunity to address environmental challenges, improve economies and reform global multilateral institutions -- at the same time. The Group of 20 (G-20), for example, was now playing a crucial role in restoring global economic stability. However, should the base not be broadened further, to include nations that were most vulnerable to the decisions of the few? All nations should be part of those important discussions. "This is the time to embrace true multilateralism," he said. Multilateralism had always been key to forging a fairer global community. The rise of global networks of trade, industry, prosperity and social values, together with the creation of multilateral institutions to guide such processes, had contributed to an improved decision-making system. Improving global governance also had to address international justice, which had to be fair to all -- rich and poor, strong and weak. He was pleased that the Assembly's sixty-third session had examined the issue of universal jurisdiction and looked forward to resolutions on that matter in the current session. Turning to the East African Community, he discussed progress, saying that the January 2010 inauguration of the East African Common Market would boost trade, investment and the free movement of some 130 million people. Indeed, there was no better way to reduce economic difficulty than by building larger regional markets that improved productivity, which, in turn, increased purchasing power and eventually strengthened societies. On the environment, he said every nation should have co-equal status and be considered a concerned nation at the forthcoming Copenhagen summit. Each nation had rights and obligations, and should be open to burden sharing, according to their ability to do so. Some key issues to be addressed included how much the industrialized nations would reduce greenhouse gas emissions, how much developing nations would limit emissions growth and how to finance strategies to conserve energy and build green technologies. Rwanda had made modest, but proportionate contributions, notably by hosting African preparatory meetings for the Copenhagen conference and implementing policies for reforestation and terracing. 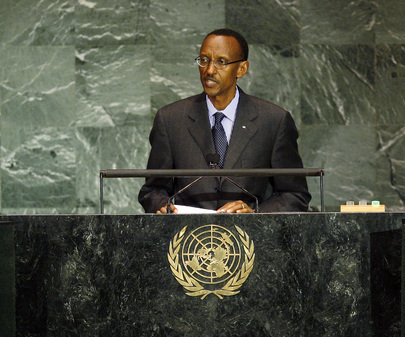 On peace and security, he pointed to continued progress in addressing the question of the Great Lakes Region. Leaders recognized that solutions, starting with a joint regional effort, could bring about peace. In closing, he urged thinking differently about various issues: fostering economic growth while investing in the environment; improving peace and stability of all regions by supporting legitimate regional actors; and engaging the majority of the world into multilateral decision-making.